It’s the time of Dine Out Vancouver again. 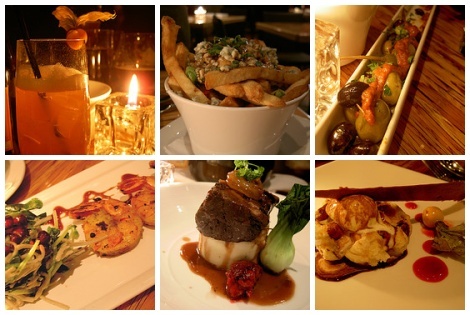 You can enjoy a reasonably priced set menu of various restaurants around Vancouver. 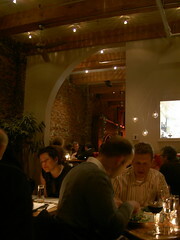 This year, we tried the Chambar Belgian Restaurant which I had wanted to go before. It’s located at a quiet area between China town and Yale town but once you are in the restaurant it’s noisy and packed with lots of people. Our waiter told me that the word Chambar means the state of a classroom when kids go crazy after a teacher leaves. They had various non alcoholic cocktails and I chose Vesper Lynde (name comes from a Bond Girl) which was Earl Grey tea based. It was excellent. My husband and friends were enjoying many kinds of Belgian beer. As for food, I chose prawn as my appetizer and my husband chose soup – the soup won. I chose beef for main course and my husband chose mussels – the beef won. Olives and Poutine a la Belge with lots of blue cheese, which we ordered as side dishes were delicious. The dessert, Belgian Waffle, had small ice cream which was bit disappointing. Since their atmosphere and service were very good, I want to go back to try other dishes. Menu is listed here. Love how the pictures turned out! Especially the Versper Lynd one. It’s always a treat to check out your blog during a busy, noisy, rainy Monday at work. I look forward to going out with you and Mr. Chilco again soon. ☆Mrs, K., I think using the mini tripod worked. Thanks for your lovely comment which makes me feel to do my blog more (T0T)!